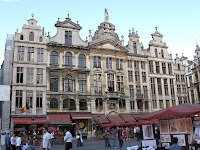 "Brussels is ugly, and we love it. And if we don't love it, we live with it. So don't be surprised that we built a terrible apartment block next to an Art Nouveau jewel or a pseudo-classic monstrosity in front of the Central Station." 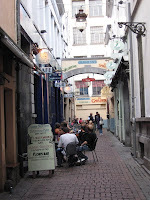 "Although most speak French in Brussels, Dutch is also an official language (as you see from the double street names.) 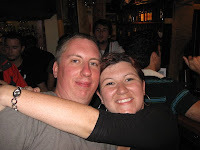 -- That would by why we got lost and even with asking a travel agent AND a cab driver they still could not get us the 4 blocks it ended up being from our Hotel to the Hostel. Not to mention it was sunny and about 85 degrees out, so much for our showers this morning. Trying to order a side of famous Belgian fries with our sandwich we shared for lunch got us this response :IMPOSSIBLE!! Guess we didn't spend enough to deserve their fancy pants fries. "A real Brussels waffle is square, and Liegeiosu is round and carmelised You put sugar on top of the a Brussels one, and nothing on a Liegeous (the sugar is baked into it.) And if you really want to look like a tourist, order extra chocolate or strawberry. Waffles are sold everywhere from vending machines to street vendors... do we dare eat one with out syrup?? Mid afternoon we decided to be different and try McDonalds in Europe. 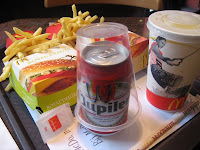 We had heard rumors you could order a beer there, and it turned out to be true in Brussels. Heather ordered one with her McChicken, while Charlie got the "Royal Cheese Delux". Just like they say in Pulp fiction. One thing we didn't like was you have to pay extra for condiments like ketchup or mayo for fries, which was an outrageous .50 cents in euros, about 75 cents in US for a container of either. We did however like the mayo already on the burger and chicken, as it was a bit more salty than we were used to. After cleaning ourselves up, and doing a load of much needed laundry, we headed out to see if Brussels could redeem itself with us. Armed with a great tourist map we got from the hostel, we headed out with high hopes. After walking a few blocks Brussels transformed from a very modern city to something we both expected when we thought of midevil europe. We wandered into what Victor Hugo called " the most beautiful square in the world." The square was surrounded on 2 sides by a huge gothic style church and a palace with the other 2 sides composed of shops and restaurants. 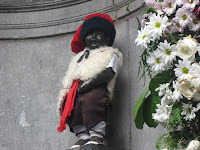 After stopping to admire the beauty of it and take some pictures, we took off in the direction of the famous Manneke Pis, or the little boy peeing statue. It was much smaller than one would think, at the most 2 feet tall, and he was dressed up in a rather silly outfit. Apparently there is a museum where you can see 800 some outfits he's worn in the past. After doing the required "touristy" things, we headed off to find Belgiums real treasure...beer! Our map named a place called Delerium that claimed to have the best selection anywhere, which we found tucked away in an ally not far from the square. Little did we know its actually about 4 different bars in one, as we sat upstairs at the tap beer bar, which had a decent selection of local beers on tap, probably 25 or so. As Heather was looking through the menu, Charlie wandered off downstairs to see what was up there....soon coming back upstairs telling Heather to "pack it up sally, we're going downstairs!" We had stumbled into beer lovers heaven. Over 2,000 beers from around the world. Yes, over 2,000. The menu was the size of a phone book, we had no idea where to begin. There was a disclaimer that they don't serve "industrial" beer, and the staff will try to talk you out of ordering something pedestrian. Would we ever leave?? Is this the greatest bar on Earth?? The place itself was quite impressive as well. On the celing there were drink trays from hundreds of different brewers from around the world. Behind the bar customers could leave a signed dollar bill from their country to leave their mark, and we noticed a few from the University of Minnesota, Winona Minnesota and Wisconsin. 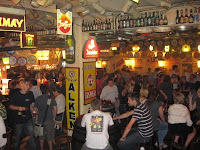 There were maybe 12 or 15 chairs at the bar, the rest of the seating was at huge wooden beer kegs with stools. We arrived about 7pm and there was a small crowd there, but soon picked up when a group of 40 came down the stairs and took over about 5 tables. We soon noticed the leader of the group taking away tray after tray of beers and became very intrigued. Was he very wealthy? Was he a celebrity? Was this David Beckham? After he had purchased round 3 for 40 people, we had to find out. Turns out it wasn't the famous football player as he admitted his right foot wasn't quite the same, but a Danish social studies teacher. He and his class were in town to tour the European Government sites, and had made time to spend a night to learn about Belgium beer. Why are all social studies teacher not this cool we wondered? Our new friend Ulrick turned out to be one of the nicest people we'd ever met. 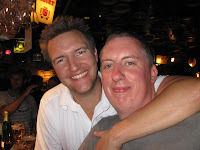 He was very friendly and answered our many questions on Europe and Denmark, and asked some of his own about us. He even told us to come to Copenhagen on our trip if we get the chance and he'd show us around. He was a big part of the reason we took this trip, to meet people like him and learn about other cultures and ways of life. Soon the first of 3 bands to play that night started. They were a cover band playing american rock songs, including the White Stripes "Seven Nation Army", which really got the entire crowd of well over 200 singing along. 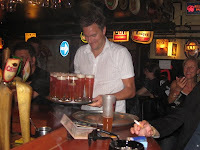 This very well could be the greatest bar on Earth, an out of this world beer selection, people from all over the world making new friends and sharing the great experience together. We won't go into too much detail on the beers we drank other than we had about 5 or 6 each, totalling about 12 different ones. We made a list to remember them by. 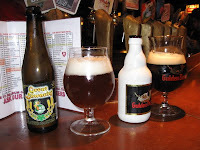 Highlights would be Gildenbier which Heather had first, and Gulden Draak Charlie had for a 2nd drink. Both were dark, wonderful beers with many layers of flavor to them. At the start of the 3rd band we decided to wrap it up as it was after midnight and we'd been there about 5 hours. We noticed our friend Ulrick had gotten his first bill for the night, 3 rounds only cost him 414 euros, which would be over 600 US dollars, not bad for probably 120 drinks I guess. 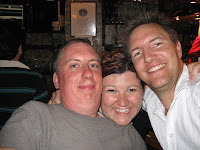 We walked over to say goodbye to him, and got caught into singing along to Bob Marleys "No Wo.man, No Cry" with the entire bar before leaving. Upon arrival at the hostel, the vending machine caught our eye, and Heather said we needed some "snick-a-ma-snacks" before bed. Our selections included paprika flavored chips, a waffle, and an ice cream bar. All were greatly enjoyed, and the paprika chips were a pleasant suprise as we really hadn't eaten all that much today. Sleep was very much welcomed at this point in our private hostel room. i cant believe that they sell waffles in a vending machine! They need to bring that trend to the US!! Amazing!